Today continues the April A-Z Challenge. This month, I'll be blogging (almost) daily about a different speculative fiction trope, one for each letter of the alphabet. Today's entry is on Dragons. I don't need to tell you what a dragon is. Chances are you pictured one as soon as you read the word. They exist in the myths and legends of a remarkable number of cultures around the world. In the West, dragons are reptilian monsters that tend to breathe fire and live in caves. Often they guard a wealth of gold and treasure, roasting any foolish adventurer who dares disturb their hoard. It takes a brave and mighty dragonslayer to vanquish these evil behemoths for good. 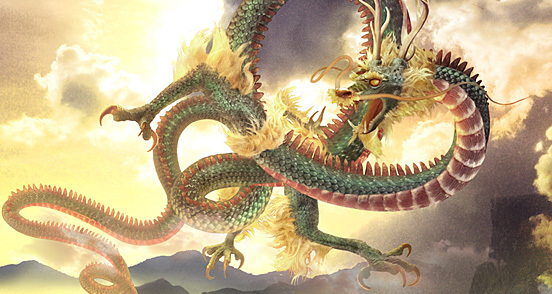 In most Eastern cultures, a dragon is closer to deity than monster. Called lóng in China and ryū in Japan, they are usually depicted as wingless serpentine creatures, forces of nature incarnate. They are more benevolent than their Western counterparts, but when angered they are a force to be reckoned with. The use of dragons as the Big Bad in fiction goes all the way back to ancient epics such as Beowulf. Already a king and renowned hero for slaying the half-demon Grendel, Beowulf finds his realm under attack from a dragon after a slave manages to steal a jeweled cup from its lair. Despite his previous accomplishments as a monster slayer, the dragon proves too much for him. He manages to slay the beast with the help of one of his thanes (the rest of whom fled in terror), but at the cost of his own life. It can be argued that J.R.R. 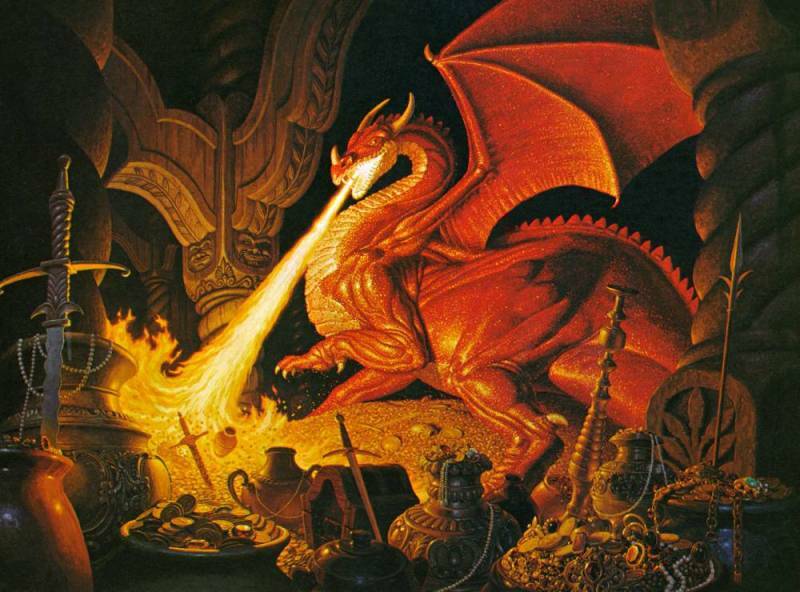 Tolkien's The Hobbit had a hand in changing the way Western dragons are perceived in fantasy works. While much of the tale is inspired directly by the aforementioned Beowulf, the dragon Smaug is characterized very differently than the creature from the legend. Rather than the bestial monster that we might expect, he is a devious, intelligent villain. When Bilbo Baggins meanders into the dragon's cave, Smaug chooses to converse with the hobbit and learn where he came from before attempting to roast him. While The Hobbit was not the first tale with a talking dragon, Tolkien's monumental influence over the Fantasy genre cannot be denied. These days, intelligent dragons are more numerous in fiction than the animalistic portrayal common in earlier stories and legends. I've yet to write a story of my own featuring a literal dragon, though I have written several that take place in a medieval-style fantasy world in which one of the major religions worships a dragon deity. Followers of this faith believe that a great dragon forged the world with his breath and now watches from the night sky. I'm not sure if I'll ever incorporate a real dragon into any of my works, but I'll have to be careful if I do. Dragons are one of those tropes that can easily become cliche if handled poorly. One thing I'll never get tired of though, is watching dragons eat people in movies. *Note: I didn't forget about the IWSG, I'll be posting an entry later today. Dragons are magnificent beasts indeed. I loved them in all shapes and sizes in movies, especially if they spit fire and eat people for breakfast. The kind ones are okay too, but they had better be terrific fliers -- dragons look awesome up the air! I agree! The ferocious dragons are the coolest, but the dark silhouette of a dragon's wingspan on the ground is awesome either way. I love dragons! Love your post! New follower. I will be visiting your blog again for sure and a lot more often! Thanks, Konstanz! I'm following you as well! I love dragons. :) Even as a young girl I preffered dragons to unicorns. They are just so cool! One of my favorites was Patricia C. Wrede's Dealing with Dragons series, even though they are (mostly) friendly dragons. I haven't read that series, but friendly dragons can be great when they're handled well! Thanks for reading. Well, yeah, because people are nummy! (so says the dragons). And they seem to like their people well done! I was so into fantasy and dragons about 10 years ago. The game I played was a high fantasy role-playing game. A famous blue dragon was everyone's favorite. I've never looked at dragons as evil or anything, but when I watched Beowulf, that was awesome! Yeah, the dragon scenes in the 3D Beowulf were great! One of the coolest depictions of a "monster" dragon in a long time. I love dragons, good or bad. My favorite was Pete's Dragon as a child. Thanks for the info on dragons. You're very welcome, KS. Thanks for stopping by! The Society On Da Run storybook has space dragons in it! I admit I wrote the thing, but the book has good and bad dragons in it (to even things out). I don't like killing dragons in Skyrim. Actually, I don't like seeing them be killed at all, but I love all kinds of Dragons!